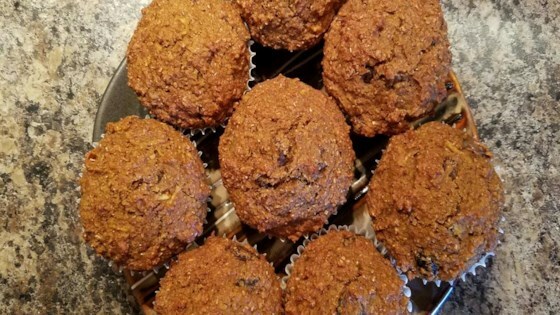 "A fall twist on a delicious and healthy breakfast favorite." Preheat oven to 400 degrees F (200 degrees C). Line 2 muffin tins with paper liners. Place raisins in a microwave-safe bowl; cover with water. Microwave on high until plump, about 70 seconds. Drain. Beat milk and eggs together in a bowl; mix in bran cereal. Let stand until cereal softens, about 5 minutes. Mix raisins, canned pumpkin, honey, apples, and butter gently into the cereal mixture. Add flour, baking soda, pumpkin spice, and baking powder; mix batter gently until combined. Spoon batter into the lined muffin cups. Bake in the preheated oven until a toothpick inserted into the center comes out clean, about 20 minutes. Transfer muffins to a cooling rack; let cool for 40 minutes.